Hello noble idiot and angst! Se-Ryung falls apart after her humiliation and decides to stop clinging on to Do-Jin which only makes him feel sorry for her more. Do-Jin anxiously waits for Se-Ryung outside the bathroom where the lady walks her out. He offers to take her back to the hospital but she asks to continue on her walk. After he wheels her toward the parking lot area, Se-Ryung asks Do-Jin for some water and insists that he get some for her. After he leaves, Se-Ryung wheels herself toward the stairs and tries to wheel herself off. Luckily, Do-Jin pauses after running for water and turns to look back. He sees that the wheel chair is gone and runs back in time to stop her. Se-Ryung screams that she does not want to live anymore if she’s going to have to live like this. Do-Jin asks what he can do for Se-Ryung and she tells him to leave…She does not want him next to her just out of guilt and responsibility…It’s a horrible life for all three of them. 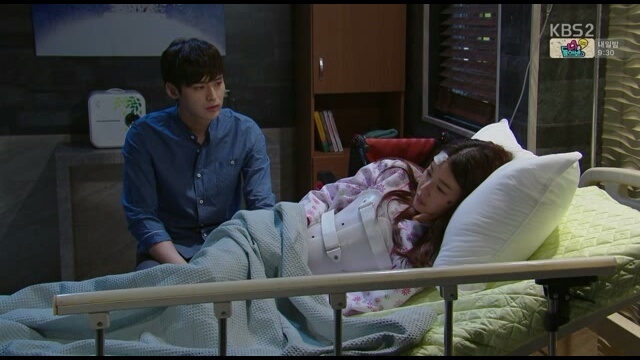 Do-Jin tells her that he will not leave her until she can walk again. Se-Ryung asks if he can stay with her if she can never walk again. Do-Jin cannot answer and Se-Ryung insists if Do-Jin is willing to take of his couple ring for her. True to dramas, Seung-Hye’s couple ring falls in the middle of washing dishes. EQ continues to try to court Seung-Ah by asking her to model for his hospital. When he offers that Seung-Ah drink out of the same cup with him, he gets beaten up by Sun-Sook and Seung-Ah. Kyung-Tae and Dae-Shil win the cutest couple of the year award. Kyung-Tae tells his mother-in-law that he came to bring Dae-Shil home because his mother-in-law requested it. However, he refuses to bring her home without her promising not to over-exert herself or working all night long. Dae-Shil refuses to give the promise and Soon-Im starts to hit her. Seeing Dae-Shil get hit, Kyung-Tae changes his tune and tells his mother-in-law that she should not hit Dae-Shil who’s pregnant. Talking in baby voices to each other, they decide to leave scary Soon-Im’s house. However, they run into Joon-Bae right before they leave and Joon-Bae tempts Kyung-Tae into joining him for some chicken. Things are not well below the surface for Dae-Ho and Dong-Sook as well. He sulks in bed instead of joining Joon-Bae and Kyung-Tae eating the chicken because he’s still miffed about Joon-Bae telling Sang-Man that Sang-Man is a great match for Mi-Ja. At the same time, Seung-Hye locks up and walks off slowly. Seeing this, Yunho calls out. Do-Jin is not next to Seung-Hye because he’s next to Se-Ryung trying to make her feel better. Se-Ryung tells Do-Jin that he should leave and call Yunho. She does not want to be with Do-Jin tonight as she knows he’s only there to protect her because he has to. Do-Jin tells Se-Ryung that he will be outside her room and sits down to brood about Se-Ryung’s words. He takes off the couple ring before putting it back on. Unaware that Do-Jin is even considering taking off his couple ring, Seung-Hye goes to Do-Jin’s studio to clean up the place while Yunho waits in his car. He gets the call from Do-Jin that Se-Ryung is asking for her but waits for Seung-Hye to come out patiently without saying anything. He walks Seung-Hye home where Seung-Hye asks about Yunho’s gloomy expression. Like a true man, he does not tell Seung-Hye about Se-Ryung’s incident or that he made Se-Ryung wait for Seung-Hye. After Seung-Hye went into her house, Yunho goes to yell at Se-Ryung for even considering throwing herself off the stairs. He reminds her about her father who is ignoring his company to search for a way to heal Se-Ryung. Do-Jin comes in to stand next to the door quietly and Se-Ryung does not notice because she’s looking the other way. So, she confesses to Yunho that she does not regret saving Do-Jin and actually feels happy that she was able to save Do-Jin instead of Seung-Hye. She states that she would do it again if the incident happened again. Beom-Seok returns and Yunho tells him about Se-Ryung’s attempt. Meanwhile, Seung-Hye gets all dolled up to leave for work. In the courtyard, she finds Joon-Bae and Kyung-Tae sleeping on the bench together. Beom-Seok goes to Se-Ryung’s room where he tells Se-Ryung that he found a place that might be able to heal Se-Ryung. Do-Jin looks at the papers and notes that there is a possibility that it would work. Se-Ryung suddenly looks p and states that she will not go. Beom-Seok asks if it is because of Do-Jin and Se-Ryung looks away. She tells everyone that she just does not want to go. Beom-Seok calls Do-Jin to his office and asks Do-Jin to come to the United States with Se-Ryung so that Se-Ryung could get the therapy. He apologizes to Do-Jin because he knows that this is a selfish request but he only wants to think about Se-Ryung at this point…so, he asks Do-Jin to convince Se-Ryung. Do-Jin goes home and finds his place clean. 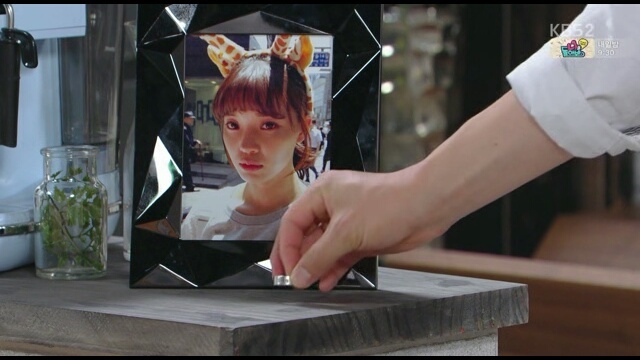 Taking off his ring, he puts it in front of Seung-Hye’s picture. Yunho drops by Se-Ryung’s room to ask why Se-Ryung is hesitating. She moodily answers that she does not know why…She just does not want to do anything. Mi-Ja finds out about Beom-Seok’s request and literally charges into Beom-Seok’s office. Refusing his offer to sit down, Mi-Ja asks Beom-Seok to leave Do-Jin alone. When she hears from Beom-Seok himself that Beom-Seok asked Do-Jin to accompany Se-Ryung to the United States, she falters. She tells Beom-Seok to leave Do-Jin alone since he did not ask Se-Ryung to save him in the first place. I thought that I would never say this but THANK YOU Mi-JA! It’s about time someone told the two idiots Beom-Seok and Do-Jin that the world does not revolve around Se-Ryung. Unsurprisingly, Yunho showed us how someone who cares about Se-Ryung but still cares a lot about Seung-Hye should behave. Even though he got a call from Do-Jin telling him that Se-Ryung is looking for him, he did not rush Seung-Hye…He just let her do her thing and accompanied her back home to show her that he is paying attention to her and cares about her. As for Do-Jin…So now, you’re about to take off your ring? Mixed feelings on this one. I wonder if Do-Jin had not catered to Se-Ryung’s every whim from the beginning if she would have gotten so bad and so obsessive. One of the biggest reasons for Se-Ryung feeling like she wanted to throw herself down the steps had been because Do-Jin had witnessed her humiliation. If in contrast, Se-Ryung had been taken care of by a dedicated caretaker hired by Beom-Seok and Do-Jin visited regularly on a set schedule so that he could see her when she was in control of the situation, would Se-Ryung not have equated her new self-worth to a guy whom she knows loves another? Is the fact that he is kindof dangling the carrot of a possibility of a long term relationship in which he stays with her if she can never walk again working against Se-Ryung’s own rehabilitation? So, when Mi-Ja did her characteristic, I’m-so-angry-I’m-going-to-barge-straight-into-your-house-office-and-yell-at-you, I was so happy!